Abcam's Fluo-8 Calcium Assay Kit - Medium Removal (ab112128) is a fluorescence-based assay for detecting intracellular calcium mobilization. Cells expressing a GPCR of interest that signals through calcium are pre-loaded with Fluo-8 which can cross the cell membrane. Once inside the cell, the lipophilic blocking groups of Fluo-8 are cleaved by an esterase, resulting in a negatively charged fluorescent dye that stays inside the cell. Its fluorescence is greatly enhanced upon binding to calcium. When cells are stimulated with agonists, the receptor signals the release of intracellular calcium, which significantly increases the fluorescence of Fluo-8. The characteristics of its long wavelength, high sensitivity, and >100 times fluorescence enhancement make Fluo-8 the brightest green calcium indicator available in the marker, and it is an ideal tool for the measurement of cellular calcium through HTS screening. ab112128 provides an optimized assay method for monitoring the G-protein-coupled receptors and calcium channels using HTS instrumentation. The assay can be performed in a convenient 96-well or 384-well microtiter-plate format. 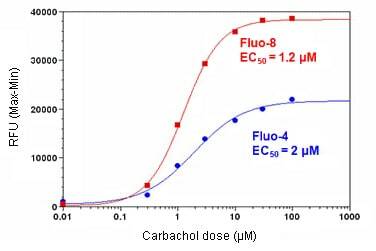 Carbachol Dose Response was measured in HEK293 cells with ab112128 and a Fluo-4 assay kit. HEK293 cells were seeded overnight at 40,000 cells/100 µL/well in a black wall/clear bottom 96-well plate. The growth medium was removed, and the cells were incubated with 100 µL of dye-loading solution using ab112128 or the Fluo-4 kit for 1 hour at room temperature. Carbachol (25 µL/well) was added to achieve the final indicated concentrations. The EC50 of ab112128 is about 1.2 µM. ab112128 has not yet been referenced specifically in any publications. Publishing research using ab112128? Please let us know so that we can cite the reference in this datasheet. Thanking you for answering my previous queries, hoping you would help me with this one too. I need to measure the intracellular calcium concentration. What equation should be used for the same. where Fmax and F min can be found out by using Ionomycin and EGTA respectively. Also if Kd of the given dye can be used as 398 or not. The lab confirmed that the formula is correct. I'm interested in the product: ab112115. My intention is to use it to measure a gradient of Ca+2 by fluorescent microscopy and study cell chimotaxis at the same time. I would like to know if this product can work in this conditions: physiological conditions of pH and Tº, and if it might be toxic for the cells. Last but not least, I would like to know what proportion of probe is recommended to use in front of a specific concentration of calcium. I will deeply appreciate your help. The Calcium Quantification Assay kit (Fluorometric), ab112115, is intended for use with solution based samples. For your experiment, it may be better to have a look at the Fluo-8 Medium Removal Calcium Assay kit (ab112128) or the Fluo-8 No Wash Calcium Assay kit (ab112129) to see if you think these would be suitable for you. I hope this information has been of help. If I can be of any further assistance, please do not hesitate to contact us again. How many plates can this kit assay? Five? Can the Greiner Bio-one plate, and the catalogue number is 655090 as suggested by you be used for PBMC's. My work is on calcium signalling and I am targeting the PBMC population. The reagents in ab112128 are sufficient for one 96-well plate, not five. Regarding the Greiner Bio-one plate, catalogue number is 655090, you could use it, however it is much better to use Poly-D-Lysine coated black wall/clear plate from BD (cat# is 356640) for suspension cells. For calcium signaling, you will need the instruments such as FLIPR, Flexstation, Novostar etc which have internal dispensing system for agonist due to the calcium signal is transient effect. Would 96 well plates of corningproduct no: 3603 suit the purpose. Thanking you for technical support. Yes, that plate will be suitable. The datasheet states that black walled and clear bottom plate has to be used with the abcam product ab112128. Will the plate be provided with the kit ? The calcium assay in cells is a transient response, so you will need a bottom-read fluorescent plate reader with a built-in pipetting system such as FLIPR, Flexstation (Molecular Devices) or Novostart (BMG). Any black wall/clear bottom 96-well cell culture treated plate will be fine. We use Greiner Bio-one plate, and the catalogue number is 655090. No, the plate is not included with the kit. If you need a recommendation for a plate, could you please tell me if you are working with adherent cells or non-adherent cells? Kindly arrange to send us the Publication/ Scientific References of Fluo-8 Medium Removal Calcium Assay kit (ab112128) as desired by the customer. We do not know of any publications that used ab112128 at this point in time. As soon as we receive news about a publication we will up-date the datasheet. I would like to reassure your customer that we guarantee our products to work as stated on the datasheet. I hope this information is helpful and wish your customer good luck with their research.